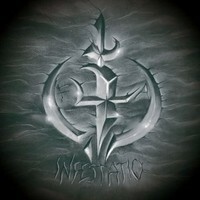 Home » Reviews » CD » I » Infestatio - F.Y.A. Brazil Metal scene is merged in Thrash Metal maybe for the tradition of bands like old SEPULTURA, CHAKAL, DORSAL ATLÂNTICA, and many others; maybe for there are some fine names now, and one name who really is expressing is the quartet from Jundiaí (SP) INFESTATIO, who arrives with their first work, a f-tracks EP called “F.Y.A”, released by the band itself. Mixing some influences of Brazilian and German Thrash Metal scenes, it’s a very harsh and aggressive (besides the guitar solos show very good melodies), intense and brutal, but not without a good technique on playing their musical instruments. Harsh vocals, powerful guitar riffs, bass and drums understanding one to another with no problem at all, making a sound that can easily make your stupid neighbor deaf. The sound production is a bit raw, done by the guitarist / vocalist Rafão, but we can hear all the instruments, and their music is not affected by this. It could be a little better, but remember that make an independent recording in Brazil, using a good studio, is too expensive (sometimes an arm and a leg do not pay the price), and even with this problem, they reached a good sounding level. The art is very simple, keeping alive the D.I.Y. spirit. Five fine tracks is what we can hear, sounding sometimes as fast as the Loony Toons’ Roadrunner, sometimes more slow and dense, but always as heavy and aggressive as Hell itself. The best ones are the catching “F.Y.A.” (very guitar riffs and vocals, with a tempo that shakes our heads), and the slower “The Shark” (with a very good work from bass and drums), but all tracks are very good. A good name for the future, for they really have a strong potential (and for sure can make us all deaf with no great efforts).